"I will raze the city to the ground" declared Hitler close to the end of October 1939, he was talking about Prague, the beautiful city which had made itself, by the 15th century an important and busy centre of commerce, not to mention a central Jewish city in Europe. It is not new that the Führer was prone to fits of anger and outbursts, but what was it that made him want to raze the city of Prague to the ground? The beginning of the answer to that lies in maybe the most moderate member of the Nazi party. Konstantin von Neurath was born on 2nd February 1873, not far from Stuttgart, in, according to his words, "a small village with a population of four hundred, where both my grandfather and my father lived". He served as an ambassador in both Copenhagen and Rome, his professional life constantly guided by the principle to fill his duty "towards the country, not the party". In 1933 von-Neurath was appointed Foreign Minister by Hindenburg, and two years later he opposed the appointment of Ribbentrop as ambassador in London, an act that would ironically, boomerang on him later in life. All in all, among the high officers of the Nazi leadership, not only did he have more backbone to confront Hitler than the others, but he actively did so. Late one evening Hitler sent his adjutant to summon von-Neurath; the adjutant then returned to the Führer with a message, "The foreign minister has already gone to bed". Hitler saw himself as a man no one says no to and sent the adjutant once more with a message that "he is to be waked when I want to talk to him". Again the adjutant returned with an uncomfortable look on his face, "The foreign minister says he will be available in the morning, he is tired now and wants to sleep". Needless to say Hitler did not like these answers, and in addition to being in a bad mood for the rest of the evening he resolved to take revenge against such defiance. In another case, in 1937 Hitler decided that the villa in which von-Neurath lived was inadequate for his Foreign Minister; it did not befit the foreign minister's official duties. Hitler sent Speer, his chief architect, to meet with Frau von-Neurath and agree on the details for a renovation and enlargement at government expenses. Frau von-Neurath said that this was unnecessary and that the building served its purpose adequately enough as it was. He asked Speer to tell the Führer, "No, thank you". Again Hitler was annoyed with von-Neurath, failing to see the humility of von-Neurath and his lack of need for extravagances as a positive thing. Aside from the amusement these stories carry, they served to show how different von-Neurath was compared to most of the Nazi party members. He was of the old nobility, and it was reflected in his attitude towards extravagance and the people under the reign of Germany. This attitude led to constant attacks on him by the Nazi party, but on 4th February 1938, two days after his 65th birthday, everything changed. Per his request, von-Neurath left the office of Foreign Minister, and Hitler did not think twice to seized the opportunity for revenge of von-Neurath's defiance. Following his leave of the position of Foreign Minister he was then appointed a member of the secret state council, "a title bereft of substance" as von-Neurath saw it. During September 1938, von-Neurath received an urgent call from von-Krosigk, the Minister of Finance, telling him that Hitler was about to wage war on Czechoslovakia and that he must stop him. Von-Krosigk's phone call led to von-Neurath taking part in the deliberations that led to the signing of the Munich Pact as an observer and mediator. On 16th March 1939, one day after the German forces entered the Czech capital, von Neurath was appointed by Hitler to serve as the protector of Bohemia and Moravia, merely to placate public opinion in Britain and France. While on the stand in Nuremberg von Neurath said that the appointment had taken him by "complete surprise", and that he had "misgivings" about the position. During his reign as Protector of Bohemia and Moravia, von-Neurath consistently managed to persuade Hitler not to go to extremes, and Hitler, on his part, was of a mind to let von-Neurath do whatever he saw fit in order to keep the Protectorate politically quiet, and more importantly, keep the factories running. Apart from the fact that Hitler could not stand the fact that Czechoslovakia existed as a state, he had his eyes on its industry, which was one of the biggest in Europe (in that period). In order to rearm his army as he planned, Hitler knew he needed the Czech industry. However, the entrance of the Germans into Prague wasn't as smooth as they would have liked. What followed next was a gradual rise in resistance actions against the Nazi regime in the city, in ways even the Germans did not foresee. Immediately after entering the city the Germans were welcomed by a widespread ignorance of them by the Czechs, if the Czechs recognized or made any gesture towards to the Nazi soldiers in Prague, they did so with a clenched fist so to speak. The Nazi Professor, Joseph Pfitzner, who was appointed as deputy mayor of Prague, suggested to the mayor to go to the city limits and hand the Germans the key to the city, but the mayor, Dr. O. Klapka, in true Czech from, refused. When von-Neurath himself arrived in Prague, the Czech schools were ordered to take out the children to line the streets along his procession route in a show of honour. From the hundreds of pupils in Prague, only ten had turned up, lining no more than one street and a small part of the embankment. The Czech children were given flags, which they stuffed down into the drains, and when the procession passed them they all turned uniformly as one, turning their backs on von-Neurath and the German occupation. Flags were placed upon houses and wreaths were sent out by Czech organizations, the whole day turned into a mobilisation of thousands of Prague citizens, as they all, including mayor Klapka, lined the streets and paid homage. This of course was unacceptable to the Nazi forces and was followed by a new decree that no Czech flag will be hung without a Nazi flag alongside it. The Czech preferred to pay the fines instead of hang the flags, and when German flags were hung they were usually torn of disfigured. The need to react quickly, to ruin or delay German measures was also inherent in the Czech resistance. When the Germans issued a decree forbidding Jews to enter cafés and allowing them to travel only on the tram platforms, the Czech demonstrated. One Saturday the trams in Prague traversed the city without any passengers, Czech workers woke up at 3am and walked to work to show solidarity with the Jews and defy the German decree. Even though this action was no more than a gesture, it speaks volumes to the Czech character, and taught the Czechs the importance of unison, an important factor in events to come. All the while the Gestapo arrests and tortures continued, and even when the first Czech patriots were killed, it did nothing to diminish the spirit of the Czechs. The Czech people were set on showing the Germans that they were fighting as a whole nation, regardless of class or party. Resistance to the Germans, big or small, was everywhere. The war had begun and the situation in Czechoslovakia alone demanded at least a quarter of a million soldiers to deal with the resistance. 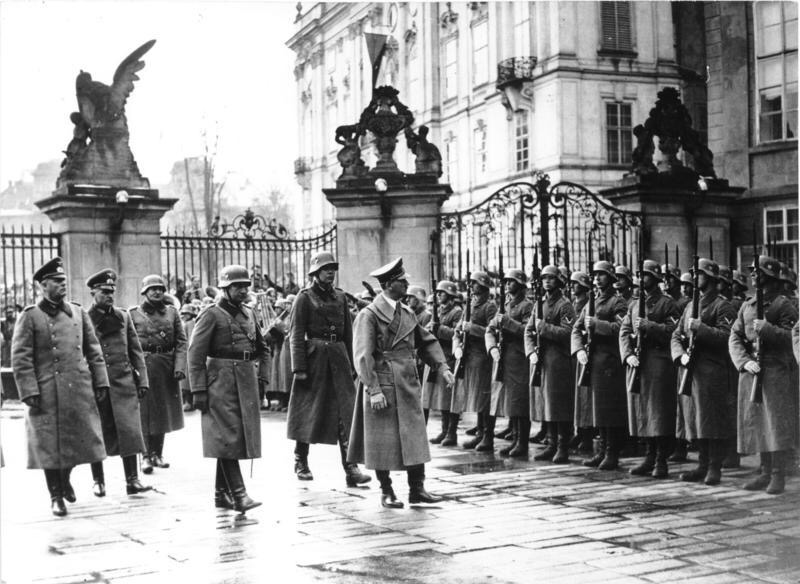 Adolf Hitler entering Prague Castle, 15 March 1939. October 28th, 1939, brought with it an opportunity. This day was the state holiday marking the foundation of Czechoslovakia, but after the formation of the Protectorate celebrations were forbidden and it was declared a regular work day. When the day arrived, the Czechs all showed up to work wearing their best clothes and a badge with the national tricolor. Many Czechs also opted not to go to work at all that day. Tensions in Prague were high; in the Old Town Square an SS soldier on duty used his rifle to smash the head of a nine year old boy for wearing the national emblem on his hat, and the crowd in the square spontaneously jumped the soldier and beat him to death. Clashes between citizens and policemen occurred all over the city, Czech patriots were arrested and tortured on the spot in Wenceslas Square, and the streets in general turned into battle grounds between armed German soldiers and Czech citizens, who were armed with nothing but their fists. A death for a death was what guided the Czechs. A student by the name of Jan Opletal was badly injured during the October 28th demonstrations and died a few days later. His fellow students asked for permission to hold a funeral for him and to attend it. After receiving assurances from the organizers that order will be kept, Deputy Reichsprotector Frank gave permission to hold the funeral. Being aware, as he was, of the mood among the students, Frank gave the permission all the while having a plan in mind. As it was, a stray Nazi car ran into the funeral procession, the three thousand indignant students who took part in the procession immediately turned to attack the car, turning it upside down, with the passengers inside. At that moment the funeral procession turned into a wild demonstration, with others joining in. SS soldiers who were summoned quickly to the scene began shooting at the crowd, wounding and killing the students. Von-Neurath and Frank left together for Berlin after the incident in Jan Opletal's funeral. When they arrived they met with Hitler and demanded he intervene against the Czech students. It was then that Hitler declared he would "raze the city to the ground". Following the incident at Opletal's funeral, a state of emergency was declared in Prague by the Germans. Nine members of the Czech student movement were shot dead, and more SS and SA forces, strengthened by motorized Wehrmacht units, were sent to Prague. On the night of 16-17th November, Nazi security forces raided university dormitories in Prague. German soldiers physically dragged students out of their beds in the middle of the night and sent them to concentration camps in armored cars. Roughly 1,200 students were sent off to the camps in an attempt to intimidate the people; nine students were executed before a firing squad at the dawn hour of 17th November. "In spite of repeated warnings, a group of Czech intellectuals has been attempting for some time to disturb peace and order in the Protectorate of Bohemia and Moravia through greater or smaller acts of resistance. It has been possible to ascertain that ringleaders of these acts of resistance are to be found particularly in the Czech universities." In addition to the mass arrests of academics in Prague, universities were closed, in accordance with the Nazi decision to eradicate all higher learning in Eastern Europe. The official decision was for three years; in reality the universities remained closed until the liberation. One can only assume this was a real life example of a tangible fear of the phrase 'knowledge is power'. However, von-Neurath's troubles did not end with the students; the Czech people had adopted a state of mind not to let the Germans have their way. They were intent on resisting the regime, if not openly, then by any other means possible. And they became quite adept at it. Knowing that big and public acts of resistance were dangerous and might only lead to harsh retaliation from the Germans, as had happened with the students, the Czech turned to small and discreet acts of sabotage. These acts were done singly at first, and gradually the Czech became more adept at preforming them. The operations themselves became more successful and eventually became large scaled, well thought out missions. None of these sabotage missions included bombs that would be thrown, or time bombs that would be left at certain places. No shots were fired. What the Czechs aimed to achieve, and also succeeded in achieving, was to slow down the German war machine. They put sand in ball bearings, and thus made the engines stop. In some firing tests, after the second test a gun barrel would burst. Trains would derail as a result of a few loose screws in the tracks, coach axles broke due to lack of oil. Even the communication mechanisms received "treatment" from the resistance. Coded telegrams would reach their destination twenty four hours after they were sent; sometimes a few letters were also mutilated and unreadable. Long distance phone calls were abruptly cut off, or even in some cases connected to the wrong number. Reestablishing connection would then take the Germans a couple of hours. Resistance agents all over Bohemia and Moravia worked alone, making sure they were untraceable, and proceeded to sabotage the German war machine as much as they could. This situation had not gone unnoticed by the Germans, and they were well aware that this sort of guerilla warfare was near impossible to fight. The enemy was invisible. Himmler blamed von-Neurath for the situation, emphasizing his weak measures against the Czech people as the main reason. Von Neurath on his part claimed that suppressing the Czech resistance was near impossible; it meant sending a nation of eight million people to concentration camps. However, von Neurath knew he had to take control and decided to take a harsher approach. In a meeting held in the Prague Castle on Christmas day 1940, one day after a whole division in the Polička munitions factory exploded, von-Neurath declared, "I shall not hesitate to set up a military dictatorship, if necessary. The spirit of the Czechs must be broken". By all means this was not a typical statement for von-Neurath. The small sabotage missions the Czech resistance succeeded in, and which proved to be a much bigger nuisance than expected, did in fact slow down the war production and became an ongoing concern of the German authorities, especially to those in charge of carrying out Goering's Four Year Plan. In September 1941, a report appeared, stating that the production of war products had decreased rapidly since the start of Operation Barbarossa against the Soviet Union. The "leaders" in this decrease of production were the factories within the Protectorate, some decreasing production by forty percent. Both the Gestapo and the military authorities found it near impossible to trace the causes, or uncover any kind of organized sabotage, a situation which made it impossible to retaliate. Another, and different, sort of resistance arose after the German invasion of the Soviet Union. The scorched earth tactic of the Soviets led the Germans to understand that the supplies to the forces would need to come from Europe and not from the Ukraine, and so they demanded of the Czech farmers their pigs and cattle in order to send supplies to the eastern front. The Czech farmers resented this demand, and rather than handing over their livestock to the Germans they opted to slaughter and disperse the meat among their fellow Czech's. This of course was followed by severe penal and monetary punishments, even to the extent of death penalties to those who did not hand over what was demanded. This mattered little to the Czech farmers who continued with their disobedience. The Germans found it hard, and almost impossible to locate, let alone punish, the saboteurs. Von Neurath's claim that suppressing the Czech resistance meant sending a nation of eight million people to concentration camps turned out to be apparently true, and for all of von-Neurath's efforts, including him trying to take a harsher stance, his time had run out. Keeping the factories running was apparently not enough, sometime close to the end of September 1941, maybe 24th or 25th, according to Karl Frank, the vice protector of Bohemia and Moravia, von Neurath was summoned by the Führer for a discussion about the situation in the Protectorate after an ongoing growing unrest. The Führer no longer considered von Neurath suited for the position, and stated that the Czechs of the Protectorate regarded von-Neurath's good heart and leniency as stupidity and weakness. Bormann, Goebbels and Himmler were called in by the Führer to discuss the matter of von Neurath's replacement. Frank was no doubt disappointed to hear that Bormann suggested appointing Heydrich to the position, when he was probably hoping to be appointed himself. The fate of the Czech nation was about to be placed in the hands of a much harsher man. The Czechs suffered greatly under the eight months rule of Heydrich's term as Protector of Bohemia and Moravia, a term that ended with his assassination in Operation Anthropoid, the greatest Czech resistance action of all, and one of the greatest resistance actions during all of the Second World War. The Czech resistance actions discussed above sometimes suffer from the large shadow of Operation Anthropoid, but as shown, they had as much an impact on the actions and plans of the German war machine as Anthropoid had, and they deserve to be known as well, these were the actions of everyday people who refused to surrender to the tyrannical oppression of the Germans without a fight. These people are proof that sometimes you don’t need weapons to fight your enemy. Gilad Jaffe is a Historian and Lecturer, currently researching the Prague Uprsing (1945).